Hype for the Toyota Supra is building rapidly at the moment. As we inch closer and closer to the official reveal of the upcoming Supra “A90”, enthusiasts are getting more and more excited. Not just Supra enthusiasts, though. All car enthusiasts are, and should be, excited about the next generation of one of the most iconic sports cars of all time. 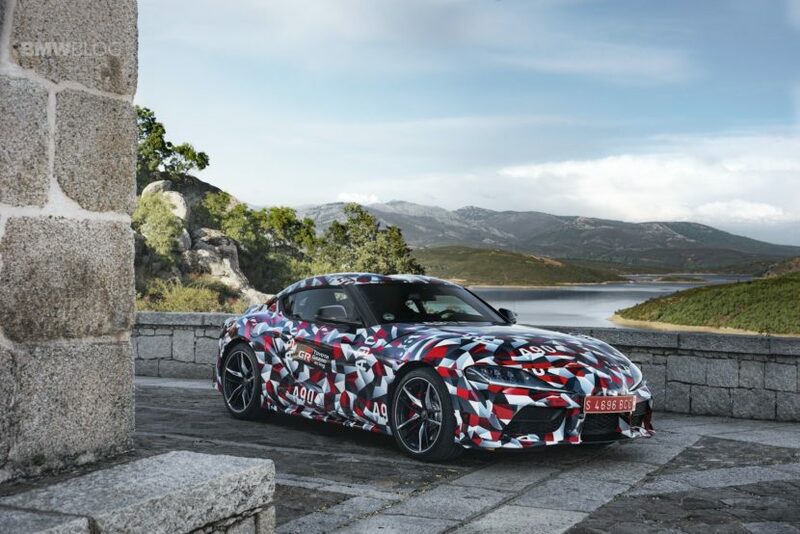 What’s interesting about this new Supra A90 is that BMW fans are paying extra special attention to it, as it shares much of its DNA with the new BMW Z4. We all know by know that the Toyota Supra will share the same chassis, engine, gearbox, differential and interior technology as the BMW Z4 M40i. So it will get the same B58 3.0 liter turbocharged engine, with around 382 hp (that’s what the Z4 M40i makes so give or take a bit for the Supra). With its lighter curb weight, thanks to its lack of folding roof, the Supra should be even quicker than the BMW. Which could make it the better buy for even BMW enthusiasts, especially if it’s cheaper. According to GoAuto, who recently spoke with the Supra’s chief engineer Tetsuya Tada, it will be priced competitively, while also being “acceptable for Toyota fans.” Now, we’re not sure what exactly he means by that, because we don’t know if he means Supra fans specifically or Toyota fans in general. The former likely won’t mind spending a premium for the Supra but the latter likely will, as they’ve come to expect a lot of bang-for-their-buck with most Toyota products. Though, Tada also says that “The goal for a Toyota sports car is not to sell a lot, but to really to sell Supra to fans who like cars a lot”. So that sort of sounds like Toyota isn’t planning on cutting the price too much on it, as volume isn’t a priority. Which sort of makes his previous statement a bit confusing. Still, with Toyota’s fanbase and clientele, we do expect the Supra to be at least a bit cheaper than the Z4 M40i. Toyota also has the luxury of being able to make the Supra less, erm, luxurious on the inside. The Supra can thankfully get away with being a bit stripped out on the inside in the name of cost/performance, while the Z4 M40i can’t because BMW’s clientele base expects the extra luxury. So it would only make sense for Toyota to sell the Supra at a price that’s at least a little bit cheaper than its Bavarian counterpart. The BMW Z4 M40i will start at around $65,000, which makes it almost as expensive as the BMW M3. So it’s not a cheap car. We wouldn’t be surprised to see the Toyota Supra in the $55,000-range. It’s a price point that makes a bit of sense, as it still makes it a premium sports car but gives it a discount from its Bavarian sibling. It would also put the Toyota right in line with cars like the BMW M2 and Mercedes-AMG C43 Coupe while also undercutting less powerful cars like the Porsche Cayman. If that price point is accurate, would it make the Toyota Supra the better buy than the BMW Z4 M40i, even for BMW fans? Not only would it be cheaper but it could arguably provide better performance. And for those with a whiff of snobbery, it would still be powered by a BMW engine, with BMW tech and BMW bones. So it would mostly be a BMW. Plus, it would be significantly more rare and interesting than almost any BMW on the road. Realistically, when was the last time you saw a Supra of any generation on the road? Exactly. So it would be something your neighbors don’t have and have likely never heard of, while also being cheaper.